For some strange reason, I thought this was an art book when I ordered it. The name Moebius must have distracted me. It was inspired by a portfolio Moebius made for the French car manufacturer Citroën, called "The Star", in 1983. In this initial short story, Moebius introduces 2 protagonists, Stel and Atan, traveling in an old Citroën on a bald planet. Not much happens in the story, but in the end, they are invited by a spacecraft to fly to an unknown world, a 'Garden of Eden somewhere in another galaxy'. The open ending of the Citroën story inspired Moebius to think what would happen after, and thus the series 'Le Monde d'Edena' was born. 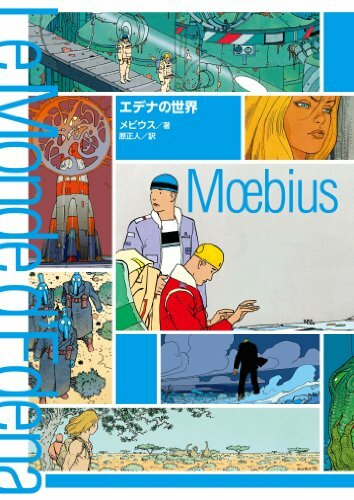 It's pretty weird looking at Moebius comics in Japanese dialog. I'll post a more proper review after I finished reading this with my elementary Japanese. There are no English translation as far as I know. Here are some pictures from the book. Epic/Marvel years ago put out several chapters to the Edena Cycle in English, but alas they are out of print and not all of them saw print. Sra has not been printed in english to my knowledge or Les Réparateurs (The Repairers). Great book wish it saw an English printing. This is great--in the English and French editions each book appears as a separate volume. Buying each one separately is expensive. Does anyone know of an aggregated French edition?